Michael Gee is the next QLD Speedway legend to be honored by the Ultimate Sprintcar Championship at Hi-Tec Oils Toowoomba Speedway this Saturday night – October 6. These days Gee is better known as the father of current QLD Sprintcar champion Mitchell Gee but Michael is very much a star in his own right on a national and state basis across a wide variety of categories. 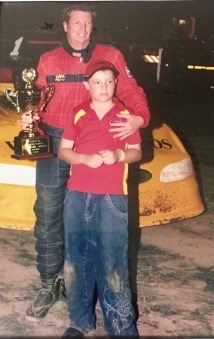 As a teenager Michael made his debut in the Bomber division at the now defunct Surfers Paradise Speedway but two years later (now as a 19 year old) he moved into the Mini Sprints and won both the Rookie of the Year honors AND the QLD Club Championship! He moved into the Litre Sprints in 1988 and spent an incredible eleven years there where he won two Australian titles and several NSW and QLD state titles before graduating to Super Sedans in 1999. The year after was telling, as Michael explains. The next few years was spent supporting and following young Mitchell’s kart racing but five years after ceasing Super Sedans another driving opportunity came up. In 2014 he drove a couple of meetings in a Modlite which he really enjoyed and finished runner up to Jamie McHugh in the QLD title at Toowoomba. As a crew chief Gee is making an impact too. Looking back on his career milestones however Gee is most grateful for one thing. The Ultimate Sprintcar Championship QLD and Hi-Tec Oils Toowoomba Speedway are proud to announce Michael Gee as our second QLD Speedway legend for 2018/2019.